Lupe’s no choir boy, but he does cover the May 2011 edition of XXL. Below he gives another reaction toLasers debuting at number one on Billboard. Issue hits newsstands April 26th. 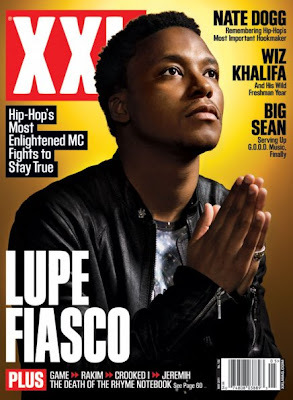 Also in this issue, Grammy-winning rapper Lupe Fiasco also boasts about his lyrical skills and why he deserves to be considered one of the best emcees ever. Fiasco admitted that he made a more [pop-sounding] album than he would have liked with Lasers and isn't proud of the artistic compromises he had to make. While he might not feel comfortable making pop music, Lupe is confident with his skills on the mic; even going as far as calling himself one of the best lyrical MCs in the game at the moment. "I can actually make the argument, seriously, that, Yo, I'm better than all y'all," he boasted. "You have people who can say that. Jay-Z can say that. Eminem can say that. Canibus can say that--if we are going line for line. If you want to relate me to the newer cats, let's go. Let's go line for line and bar for bar. If it's all about spitting and metaphors and MCing and lyrics and entendres, I will eat 99 percent of you dudes up." (XXL Mag). Chicago is definitely proud of you fam, although you may have had to compromise some to get L.A.S.E.R.S to your fans, we at BLVDAVE Salute you none the less !!!! BlvdAve is a skateboard company. DO NOT TAKE ACTION WITH THE NAME. Unfortunately its several different companies with the "BlvdAve" name. Dont worry we're lookin at several different names for the future.